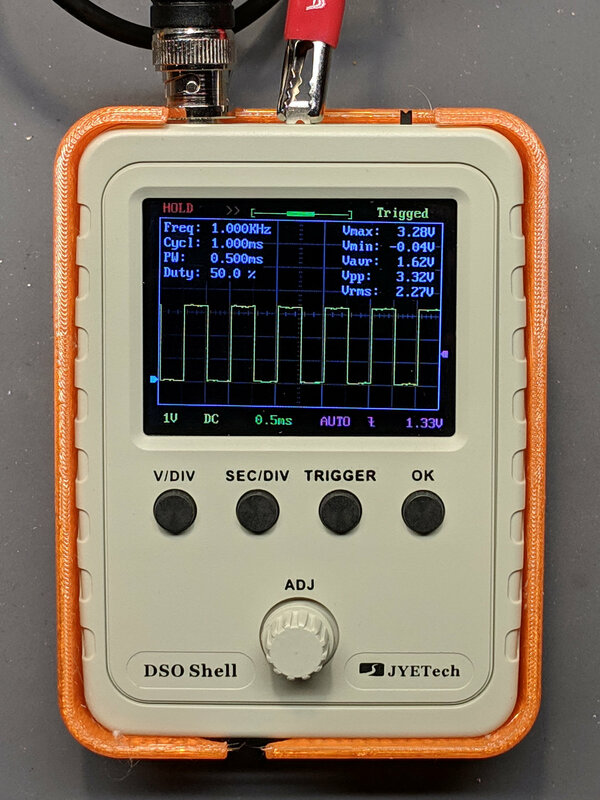 I did a quick build of a JYE Tech DSO150 oscilloscope to see how it’d work in a proposed Squidwrench advanced soldering class / kit build session. Just finished assembling the kit, which required two hours; I’m admittedly fussy. The one joint I missed on the input coupling switch required a complete disassembly, but all the rest worked fine. The UI is much better than the DSO138. Soldering the BNC connector requires lots of heat. My ordinary Hakko iron had inadequate grunt, so I deployed the hulking Radio Shack 150 W gun and did the job in seconds. The resistors require a meter to measure them during installation, because they’re 1% 1/8 W jobbies with many teeny color strips in Chinese tints you’ve never seen before. I could not sort them visually, even with a lighted headband magnifier, and I know what I’m looking for. The caps are marked, but using a meter builds confidence. And, yes, the kit had all the right parts and they all worked. 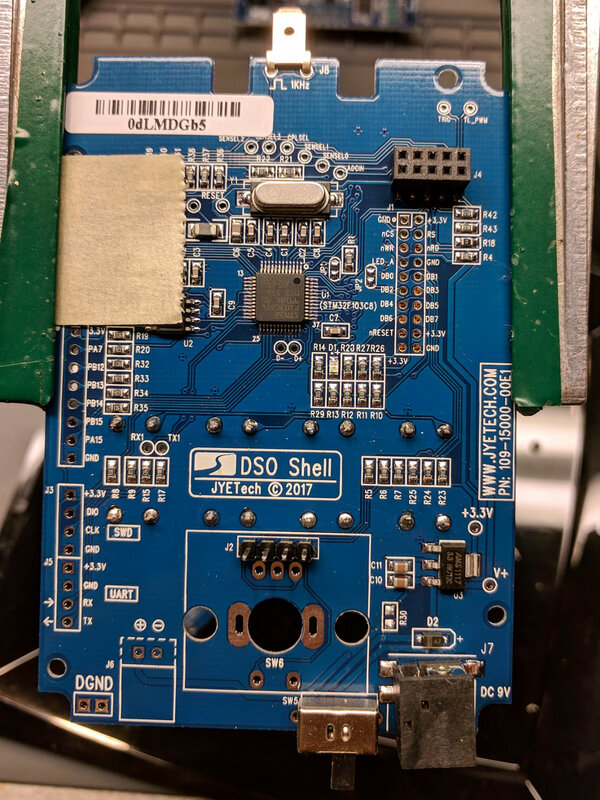 The instructions call for powering up the main board before starting assembly, then again after removing a 0 Ω jumper resistor, but that’s the extent of the “testing” required. They recommend a flush cutter and I’d say it’s pretty much required. An ordinary diagonal cutter won’t get close enough to the PCB. I needed an angle-tip tweezer to lay the PCB screws in place. Don’t install the knob until the very last step and maybe wait until you’ve verified all the functions. You have been warned. The minimum power supply voltage really is 8.0 V, not the 7.4 V from a not-quite-fully-charged pair of lithium cells. A 9 V alkaline battery will last a few minutes. A noisy boost converter / crappy 9 V wall wart translates directly into noise on the display, particularly on the internal calibration signal. The “0.1 V” calibration signal turned out to be 150 mV, as measured on a real scope, at 1 kHz. 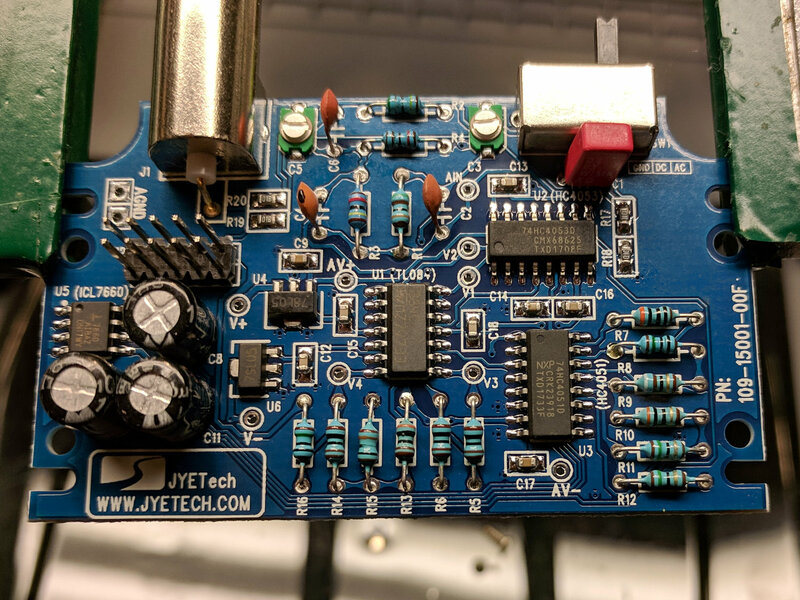 The 3.3 V signal is closer to reality. Both are noisy from a noisy supply. All in all, it’s a pretty good scope for thirty bucks! Newbies will find it a challenging three hour build, for sure.